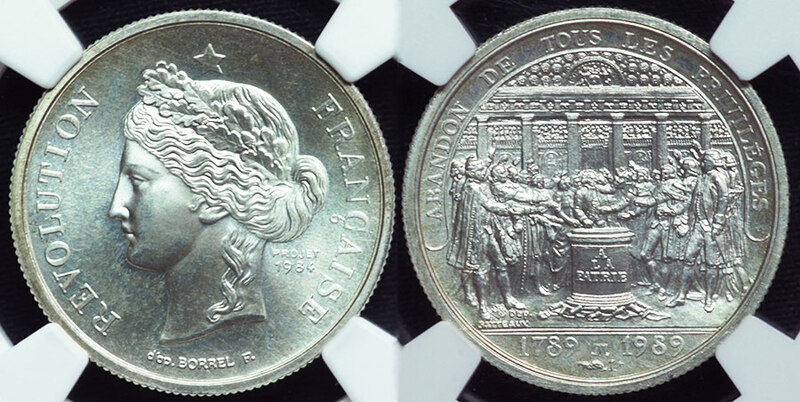 This is a small (21mm) silver medal issued to commemorate the very first act of the French Revolution in 1789. That being the vote to curtail the privileges of the elite ruling classes. Obverse is probably a depiction of Marianne in an oak leaf crown, star above. In the right field are the words 'Projet 1984' below is the name of the designer stated as 'd'op BORREL F.' The reverse has a scene of the revolutionaries involved in the vote around a short column with the words "A LA PATRIE"; to the left below appear the reverses' designer 'd'op GATTEAUX.' In exergue "1789 m 1989" with privy mark cornucopia 1 *, below.